I hear you’re watching your waistline a little bit. Well you know what? So do I. 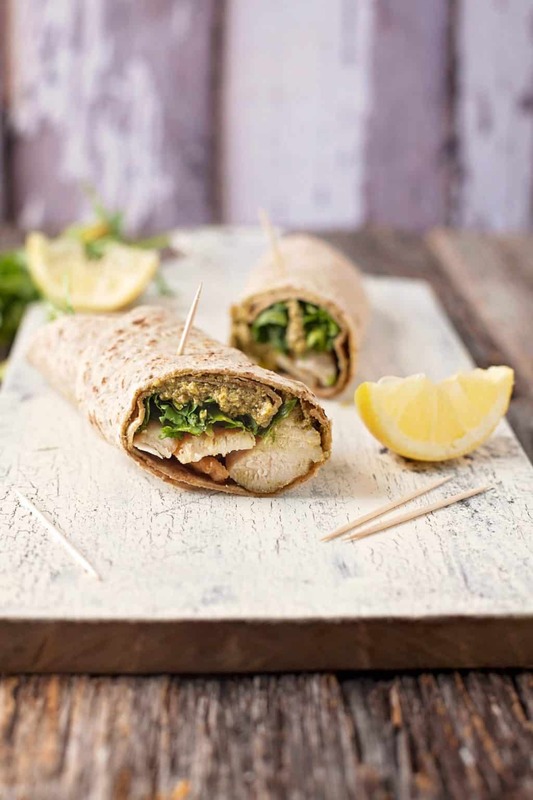 And I do it with recipes like theses light and healthy chicken pesto wraps. If you all think for one minute I eat all the food on this blog, you’re nuts (I feed most of it to my husband’s immediate family of 25)–but if you love the occasional indulgence and know life needs a little more moderation, we’ll be good friends. You can find balance! There’s a time and a season for triple cheddar loaded mac and cheese and a side of meatloaf. It’s really okay–as long as it’s not every single night. And judging by what you tell me about your schedule, it’s not every night. It’s not once a month. Instead you’re grabbing whatever you can find wherever you can find it. Burgers. Pizza. Nothing at all. I know that’s reality and I don’t fault you ONE BIT. But when you have a few minutes–maybe 8 or so–you can fry (lightly in olive oil) your chicken and stick it in the fridge. Then the rest of these light and healthy chicken pesto wraps is just assembly. They make a great lunch or quick dinner, and they’re as easy as making peanut butter and jelly and cheaper than a drive through. If you wanted to do this even faster, go ahead and pick up a rotisserie chicken–man I love those things–and move on with the assembly. You’ll find pesto in your refrigerator section wherever fresh pasta is sold. If you don’t like arugula, go ahead and use a spring mix, fresh baby spinach or lettuce. It all works. Just get something good in your body. 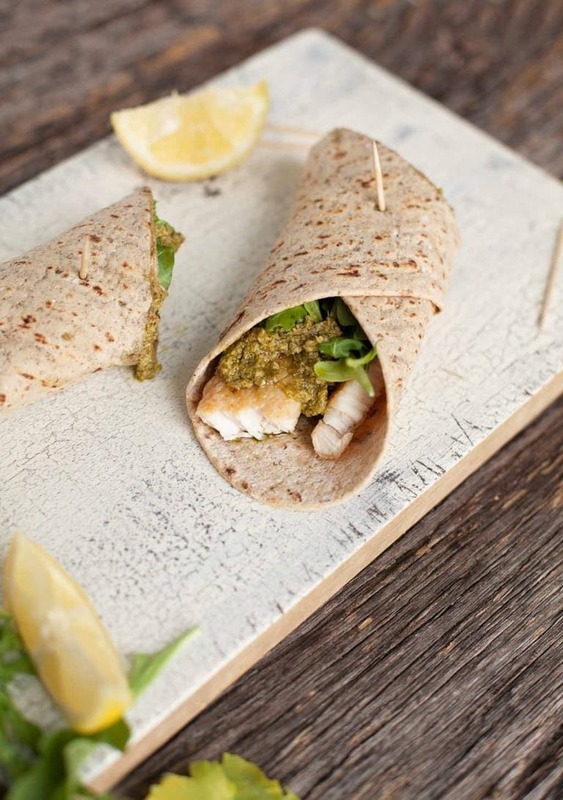 Watch your waistline and enjoy big flavors with these easy chicken pesto wraps. Pesto is a great shortcut to big flavor. Feel free to add all the toppings you love and take them on the go! Sprinkle salt and pepper over chicken and toss to coat evenly. Set aside. In a medium skillet over medium-high heat, add the olive oil. When the oil is hot (test it with a piece of chicken) add as many as will fit without touching and fry on each side until brown--about 5 minutes per side. Transfer to a paper towel lined plate to drain. 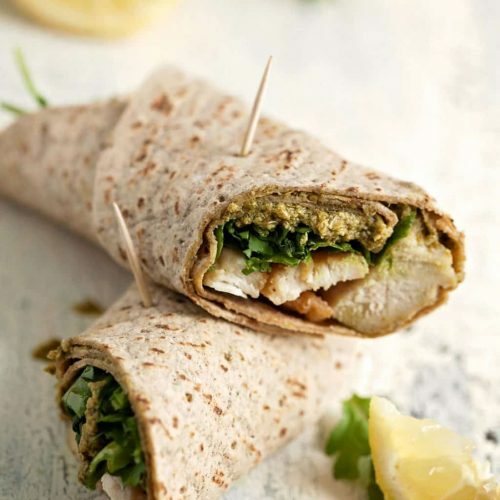 Working with one wrap at a time, add 2 tenders, 1/2 cup of arugula and 1-2 teaspoons of pesto (or as much as you want). Roll it up, slice it in half and secure it with a toothpick if needed. All ingredients will store in the fridge unassembled for up to 5 days.